An extensive range of standard site configurable rack accessories including in rack cable containment as well as equipment mounting enhancements allows users to enhance the rack to suit individual installation or user demands. For applications where in-rack power draw is >1.5kW Eaton recommends selecting an RE Series Active Rack variant. 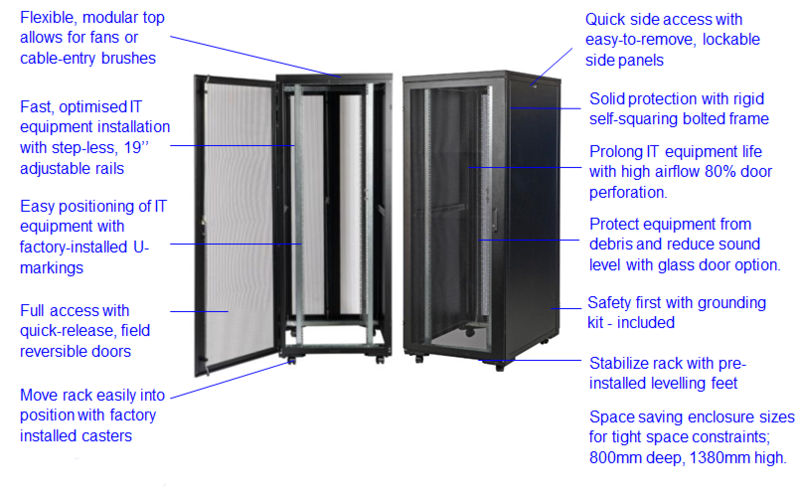 RE series IT racks are designed for fast and easy set-up, the RE Series is provided with features IT specialists need in an affordable, ready-to-go enclosure including casters, lockable side panels, step-less rail positioning, U-markings and a grounding kit. A full range of easy-to-use cable management, airflow management and storage accessories are available. Importantly, the RE series provides the ideal platform for seamless integration of critical infrastructure components such as Eaton’s UPS’s, rack PDUs, power management software and services. With this full suite of products, integrators can simply install their preferred IT equipment and software and deliver a fully integrated system to their customer.